Did you know that One Fun Photobooth not only custom designs a different photostrip or layout for every wedding and event, they also switch up the props to make sure they match up the theme your style and theme? One Fun Photobooth has invested thousands of dollars in stocking a complete prop house that is filled with over 4500 hats, signs and props allowing their crew to rotate and change out the props for every event.Props range from the comical to cute and every genre you can think about including roaring twenties, country western, military, nautical, rustic, shabby sheik, vintage, super heroes, fantasy, Star Wars®, Marvel®, Disney®, movies and more. Don’t forget the sunglasses. They have thousands that match the props and they even have mustaches and not the ridiculous paper ones. To complete the packages, they also have professionally made signs that cover all types and styles of weddings and events. All the props are stage quality. As in they are not paper and cardboard and the combinations for your wedding photobooth or event photobooth are endless. So unlike the “mom and pop overnight” photo booths that have popped up lately where your guests are stuck with the same 6 hats, 2 props and paper shapes on wooden sticks are seen in EVERY photo from every wedding/event they do, you get a variety of quality stage-worthy props, glasses and signs from their prop house that makes your guest’s photobooth experience unique and special. 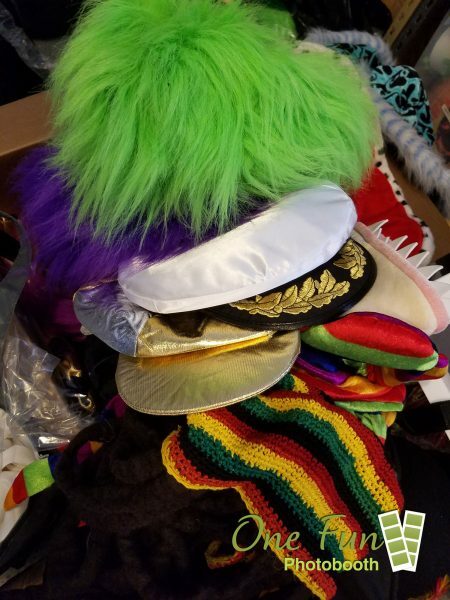 Of course there will be some of the favorites, but you will see new props, signs and glasses that come from the One Fun Photobooth prop house that get added on a weekly basis. This is all a part of their dedication to providing each client with a unique photobooth experience that is second to none. One Fun Photobooth part of MME Event Group LLC is licensed and insured in the state of Idaho, members of the Twin Falls Chamber of Commerce, members of the Sun Valley Chamber of Commerce, rated by the BBB, 2014-2015 Wedding Wire Couples Choice, 2013-2016 Best of Weddings.